I highly recommend the "E-lights" from the Egypt Garage. Wireless, easy to install, reliable, you can quicky take 'em off for those "pure showing moments" too! I have two sets that I swap around between 4 cars. 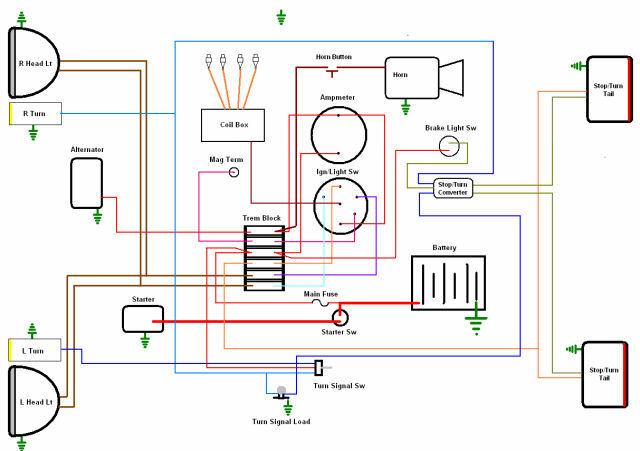 Frank Harris posted his wiring diagram several years ago for his turn signal add-on but I can not find it now. Safety comes first, in my opinion. I made my own turn signal setup, and included brake lights. I took a spare horn button and integrated a DPTP switch into it. 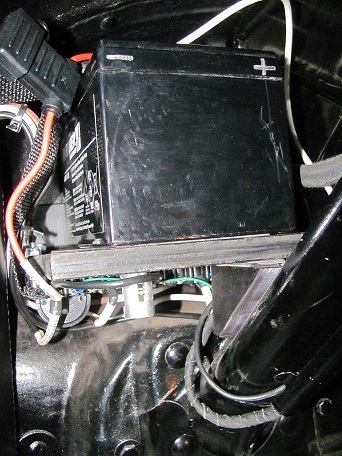 I made a simple circuit with a 12volt battery and installed it under the dash right above the steering column. For lights I am using small motorcycle lights mounted under the T.
You have made a good decision but be sure the ones you put on your car can be easily seen. What looks good standing 8-10 ft in front or in back of your car may not be very good viewed from 6-8 car lengths away. Use LED if at all possible. I went to a big truck stop near by and looked thru the huge selection of all the lights. Painted the fixtures black and used the amber lenses. Look good and work well. 6 v too. The E-Lights are very good and very bright, the only problem i had is the mount is flimsy and broke due to vibration, i have not re-installed it as i am trying to figure out a way to strengthen the rear mount. I have E lights mounted on the shelf behind the seat of my coupe and really like that set up.. 0nly problem is there is no set up for the front. I have never understood why anyone would want to question 'not original' on a Model T car. Going for a Stynoski, or participating in a high point car judging? OK then, leave them off but this gang is probably more often then not part of the trailer set and has no concern getting caught out at dusk or when dark clouds roll in. Safety above all else, even in bright daylight folks always assume a T is faster than it really is when they are behind you; slower than it really is when they want to hole-shot in front of you, and got a '0' on the test for what hand-signals originally meant. Getting caught out at dusk is equally scary! Caught in dusk, I always had modern iron follow me close. Turn signals by hand have always been iffy, and folks have a 100% expectation of a big bright brake light to signal 'stop'. After 40 years of T's, I just this year added lights/4 ways/turns/brakes to my hack and did it with what I felt was era sympathetic. I decided to make reproduction era specific asphalt impregnated cloth wire looms using color traced wires. I also removed the original wire set supplied integral with the turn signal switch and went to an era type color tracer system for all of the new stuff. (This made the wiring part 5 times the price that normal point to point wiring cheap wiring would have cost and I don't recommend it as it is out of sight out of mind when done, but it was therapy for me to prove I could do it. I ended up with LED lamps in the yellow beehive as they were the brightest of all the lamps that I tried and I tried them all. LED in the back didn't work as well as expected for two reasons...the Model A repro red glass is thick and a cranberry glass to begin with. Even with 32CP6V lamps it is no better than my '15's E&J #9 when lit. The 2nd reason is not enough resistance/ impedance to 'fire' all 4 LED on a 6V system without doing something else and I just left the 32CP6V lamps in for now. I'll be putting 50CP lamps in the light/turn signal section of the tea-cup housings in the future. 32CP brake lights work well as the Model A lens has the STOP emboss cast in the glass allowing lots more 'light' to pass through. I have been warned that it may be illegal to have running lamps brighter than brake lamps...but in use, the lower CP lamp is still brighter due to the lens. It wasn't a hard task to do...the only complication was my deciding to make wire looms that look factory/era made and it added bunches of unnecessary time and money. 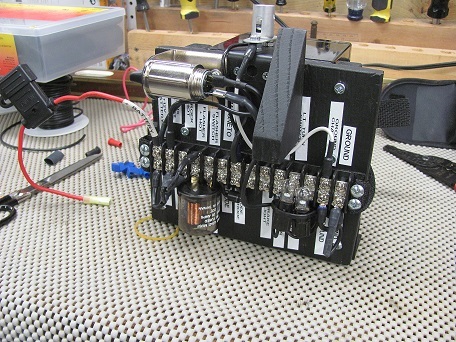 If you would like to consider going this way, I can send you photos and the wiring diagram that I came up with. Myself no matter how or where their hidden i think they make a nice car look cheap!! Bud. Lang's period looking turn sig. switch, ($20 with "reminder" flashing bulb in the handle) removable "A" tail lamps with 1129 bulbs in both sockets, Fun Projects brake light sw. kit, bee hive fronts mounted on the head lamp stalk nuts. Sorry to say it didn't make a darn bit of difference to whatever jerk was behind me. I have then swapped the 12V bulbs with various 6V LEDS. In the comming season I will use that whenever I drive longer distances while taking it off during the events. Then I not only have larger and brighter rearlights and turnsignals, but also a large reflective in the center of the car. 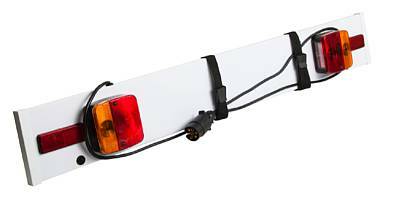 The rearlights are standard red model T with 2 filamen bulbs with combined brake light and turnsignal. I would rather look cheep then dead! I kept mine simple, Signal-stat 600 simple hook up but no 4 way. Separate brake/tail light and turn signals lamps in the rear.